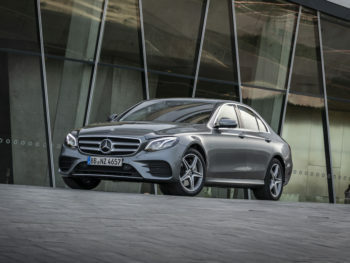 Mercedes-Benz has added a petrol plug-in hybrid to the E-Class line-up to complete its PHEV range. Available solely for the saloon, the E 300 e joins the E 300 de diesel PHEV launched a few weeks ago in both saloon and estate guises. The E 300 e is powered by a 208bhp turbocharged 2.0-litre petrol engine with a 120bhp electric motor and offers an official combined figure of 134.5mpg and 46g/km. It can travel from 0 to 62mph in 5.7 seconds and has a top speed of 155mph. Official electric range stands at 31 miles and the 13.5kWh battery can be charged from 10 to 100% in under two hours with a 7.4 kW charger, or in under four hours from a standard three-pin UK socket. Two trim levels are offered: an entry-level SE and AMG Line. The SE is priced from £47,450 OTR and includes parking assistance with front and rear parking sensors, blind spot assistance, touchpad with controller, 18-inch alloys and keyless ignition. The AMG Line trim is priced from £49,945 and adds AMG exterior bodystyling, 18-inch twin-spoke alloys, leather upholstery, AMG steering wheel with touch control buttons and privacy glass. Order books for the E 300 e are open now with first deliveries arriving in spring 2019.